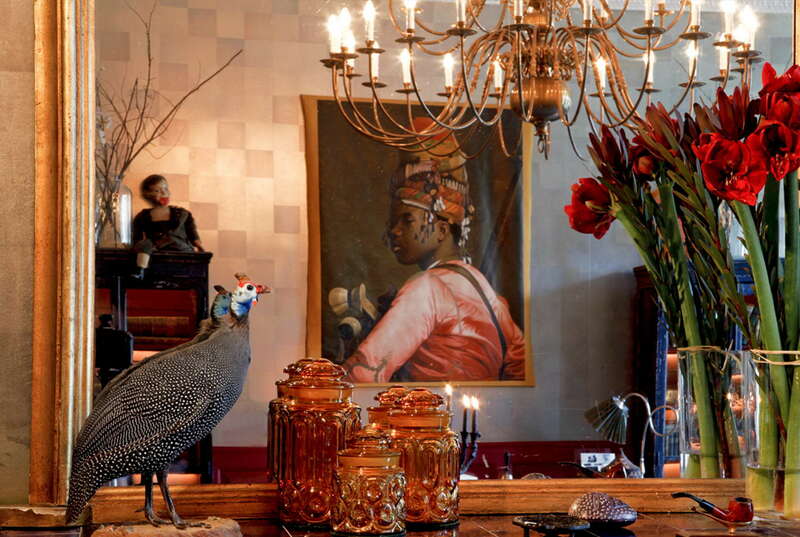 In the hands of celebrated artist and filmmaker Mary Jordan, Kau Manor’s interiors have fittingly become as rich as its history. Following an extensive restoration, the Manor’s architectural magnificence has been restored and augmented with all of the modern luxuries. Beyond the carefully curated art, objects and antiques, the grounds will be home to Kau Art Center, which will display the work of world-renowned artists. 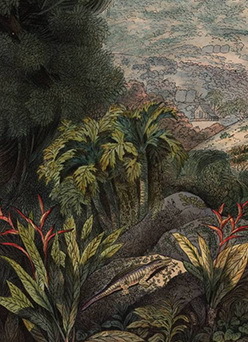 Amongst Otto von Kotzebue’s belongings, Kau Manor displays a collection of original engravings made by the German-Russian painter and explorer Louis Choris (1795-1828), who accompanied von Kotzebue on the Romanzov expedition. 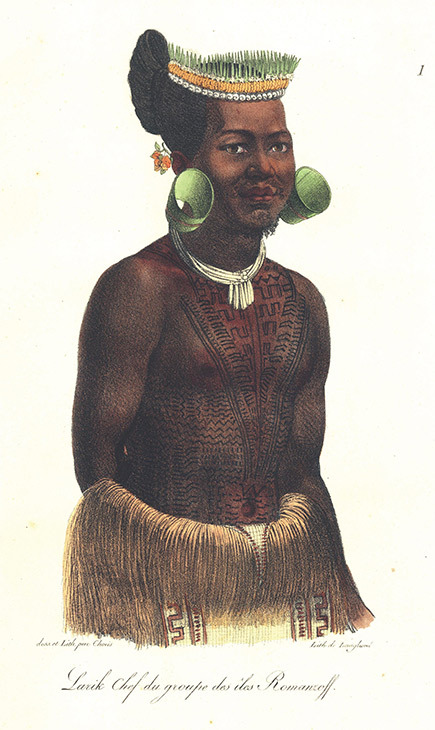 As one of the first recorded sketch artists of expedition research, Choris’ works include the famous portrait of King Kamehameha I of Hawaii, the Chief of Ratak Islands Larik, and dozens of drawings depicting the tribal life of the Pacific Islands, Japan and the northwest coast of North America. Kau Manor’s restaurant hall displays a selection of enlarged high quality reproductions of Choris’ work. Kau Manor houses one of the best library collections on Baltic German history in Estonia with some 3000 texts (many of them rare) on the region’s history, culture, economy and politics. Kau Library also holds one of the two known copies of an Estonian Prayer Book from 1728, as well as several books from 17th century, the first printed book in Georgian language, the first printed version of the Chronicle of Henry of Livonia, and an original map used to negotiate the Estonian-Russian border at the Tartu Peace Treaty negotiations in 1920. Kau Library also holds one of the two known copies of an Estonian Prayer Book from 1728, as well as several books from 17th century. 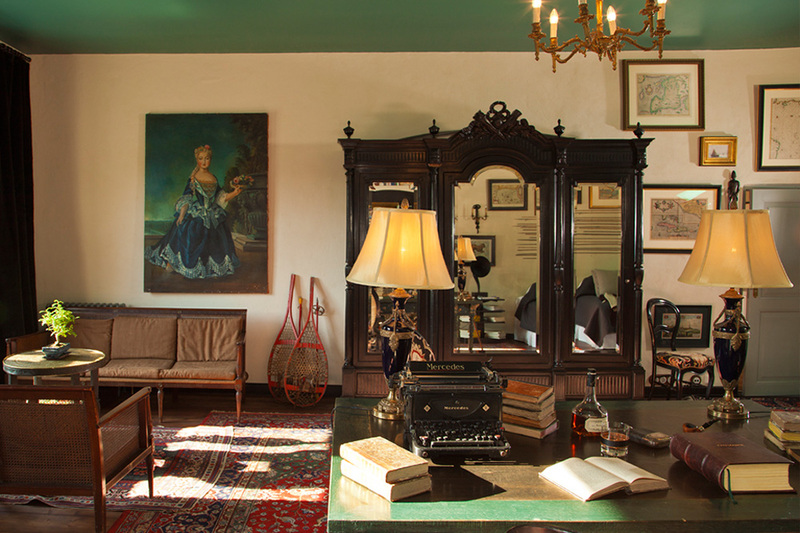 Kau Manor's distinctive interiors and wide selection of historical objects collected to the Manor make the whole complex unique in the world scale. Ana Corbero is a visual artist whose paintings, sculptures, and designs have received acclaim on all continents. Born in 1961, the daughter of Catalan sculptor Xavier Corbero, she studied in the United States (Dallas, Philadelphia, New York City) and has lived in London, Barcelona, Paris and Beirut. In 1996 she married Nabil Gholam, the Beirut-based architect. Her figurative works display a sensitivity to the fragility of nature and the delicate relation between humans and their environment, as well as the variety and complexity of people’s inheritances from family, culture, and history. The innocence and simultaneous lucidity of childhood is a theme that runs throughout her creations. Among her landmark creations are large paintings of water surfaces (the 1001 Tears series); colossal sculptures of contemplative, childlike figures (Little Buddha, Buddhito and Buddhette), which have been exhibited in various public urban settings; the Postcards for Every Occasion print series; and the Maus Haus design creations. 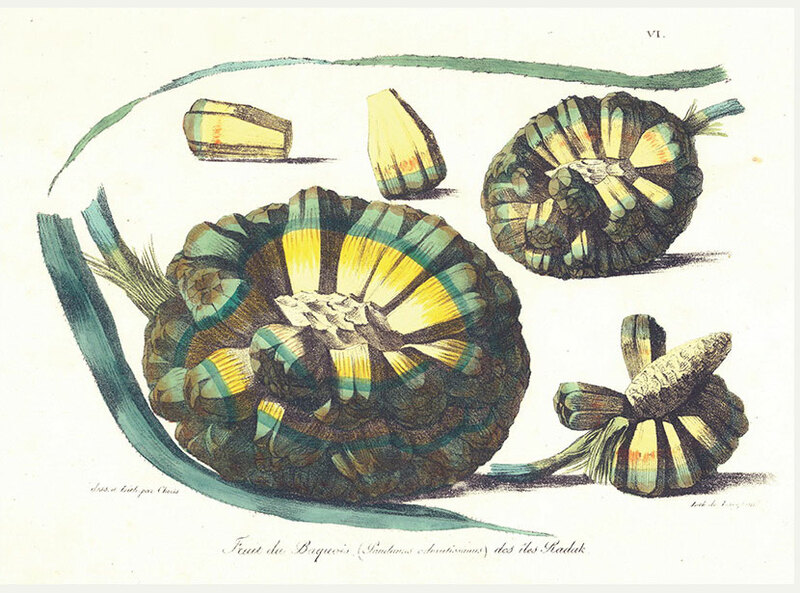 Since 2010, and as a direct result of the Israeli/Lebanese war of 2006, Corbero has published two collections of poems: Prickly Pear Poems and Pettered Patter Poems. In 2013 she held a solo exhibition, I&I = Us, at the Beirut Exhibition Center conveying apacifist message. It had taken her 18 months to put together. She has had individual exhibitions in places including London, Barcelona, Madrid, New York City, Dallas, Istanbul, Beirut, Napa Valley, Tokyo, and Singapore. 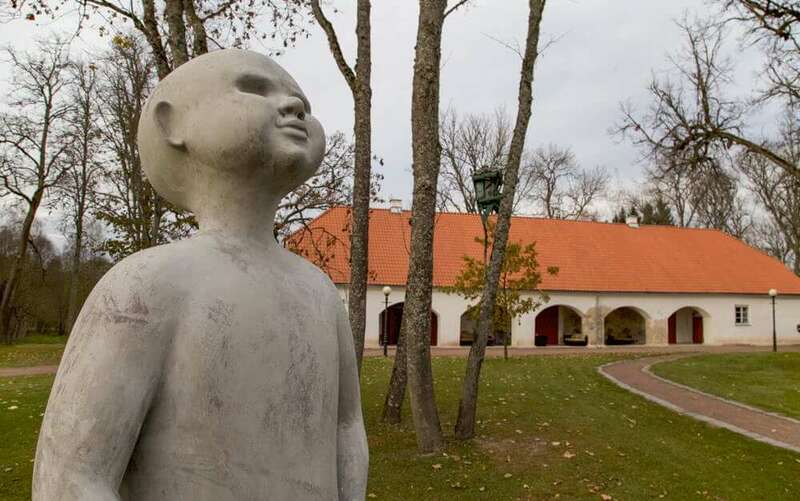 Born in Tallinn in 1975, Kirke Kangro graduated the Estonian Academy of Arts (EKA) in sculpture in 1999. In 2009 she received MA in inter-disciplinary arts. Since 2010 Kangro is a lecturer at the Sculpture Department, since 2011 head of the Sculpture and Installation Department. Kangro became a Professor in 2014 and since 2016 Dean of the Free Arts at EKA. She has exhibited her works at exhibitions in Estonia, Finland, Germany, Latvia, and the Netherlands. Kangro has also been an active curator and in 2010 received the Estonia Culture Capital Annual Award for curation. Kirke Kangro’s Black Object was exhibited in Château d’Asnières, France at an exhibiton “Libérté/Vabadus 2011”. In 2012 it was exhibited at the Baltic Nordic sculputre exhibition in Riga, Latvia. 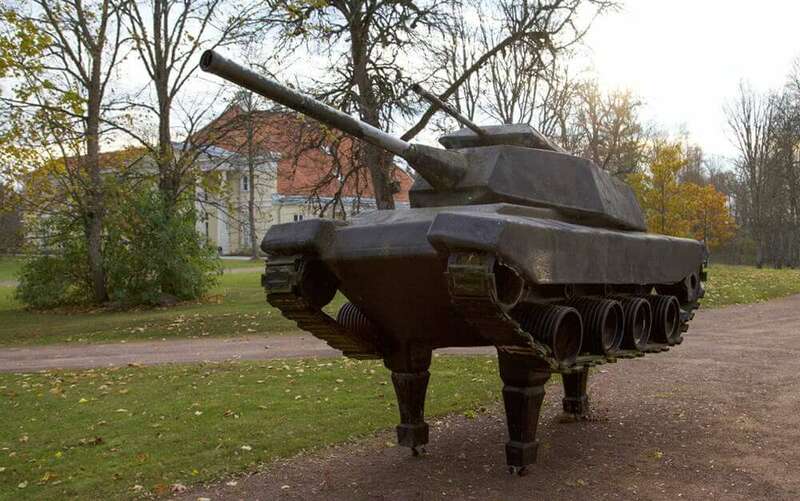 It is alternatively called tank piano or piano tank, depicting a conflict of military force and culture. Committed to helping artists and promoting the arts, Kau Manor aims to be an empty canvas for all sorts of expression. To this end, the Manor has hosted many cultural events year round. The archive of the Estonian writer Jaan Kross is being prepared by his son Eerik-Niiles Kross. Kau Manor has hosted many various cultural events. In summer divers music festivals at the Kau Manor have attracted the best in music, and have offered unforgettable performances in a one-of-a-kind environment. Additionally, movie screenings, theater, conferences, concerts and exhibitions also have invited guests to participate in the Manor’s cultural richness. By far the most translated and nationally and internationally best-known Estonian writer, a kind of cornerstone and conscience of the nation, is Jaan Kross (1920-2007). He was nominated for the Nobel Prize for Literature on several occasions for his novels, although he in fact started his literary career as a renewer of poetry and a translator. In 1990 Kross won the Amnesty International Golden Flame Prize. In the future, Kau Manor will house the archive of Jaan Kross, which is being prepared by his son and one of the owners of the Manor, Eerik-Niiles Kross. The first step towards that direction is Jaan’s – large 150-200 seat brasserie that opened on the Manor’s grounds in 2016. The vibrant space is equipped with photos of Jaan Kross and his life and sounds of blues, jazz and old rag time fill the air with sounds of Jaan Kross and other famed writers voices on music tracks. Born in 1920 in Tallinn, Jaan Kross went to Jakob Westholm Grammar School. In 1988, his book “The Wikman Boys” was published. Then he studied law at the University of Tartu and was arrested first by the Germans, then after the war by the KGB. On his return eight years later from the labour camps and internal exile in Russia where he spent the years 1946–1954 as a political prisoner, Kross was the one to renew the content and form of Estonian poetry, giving it new directions. His first collection “Söerikastaja” (The Coal Enricher, 1958) had been partly composed as a prisoner. Kross began writing prose in the latter half of the nineteen-sixties, first with a film scenario, “Liivimaa kroonika” (A Livonian Chronicle) which dealt with the life of the author Balthasar Russow (1536–1600) and which also became the subject of his first masterpiece, “Kolme katku vahel” (Between Three Plagues, 1970), a suite of four novels. From that time onwards Kross moved by stages nearer to our present time in history, describing figures from Estonian history, first in short stories, later in novels, also in writings where he has drawn upon his own experiences. The heroes of his novels tend to be of Estonian or Baltic German origin and cultured people, though on the margins of society and are usually faced with a moral dilemma of some sort. Kross himself has termed his own books psychological character novels, which is by no means to underrate the time and space which surrounds these figures: Kross has attempted to be as accurate as possible with regard to historical detail, whether the work is set in the 16th or the 20th century. When writing about history, Kross always managed to make hints and allusions to his own era. Russow’s Livonian Chronicle plays around with the idea of censorship, while in his allegorical masterwork “Keisri hull” (The Czar’s Madman, 1978), Timotheus von Bock is declared mad for criticising the Czarist regime, a fate which also befell dissidents in Soviet times. The protagonists, keen observers and somehow outsiders: the title of Kross’s novel “Vastutuulelaev” (Sailing Against the Wind, 2002) is somehow characteristic of almost all his main heroes – they are all heading stubbornly and proudly headwind. In “Professor Martensi ärasõit” (Professor Martens’ Departure, 1984), the professor of law, Martens, serves an empire which blithely ignores human rights, whilst the excavations in the novel of that name reveal a 13th century manuscript which threatens the totalitarian nature of the Soviet regime by its contents. In his autobiographical novels, set against the background of personal experiences, Kross describes the loss of Estonian sovereignty in the late thirties and early forties – for example in “Paigallend” (Treading Air, 1998) the fate of number of schoolmates as the Estonian Republic disintegrates and the Second World War ensues. 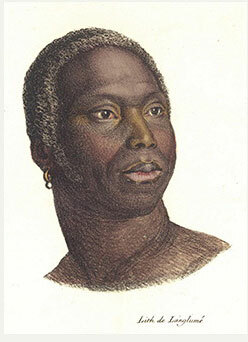 Perspectives on the past were so important for Kross, that in his novel “Tahtamaa” (Tahtamaa Farm, 2001) the problems arise regarding the restitution of state property to its former owners during renewed independence in the nineties. Criticism of society can be seen in a historical perspective, although this time Kross wrote about the present day for contemporary readers. Against the background of his own work, Kross held a series of lectures at the University of Tartu, which are collected in the volume “Omaeluloolisus ja alltekst” (Autobiographism and Subtext, 2003). Jaan Kross’ novels, his short stories and novellas cover a cross-section of Estonian history in a Europe an context. In the confident composition of his works, Kross has varied both form and narration, so that his works fit into the canons of classicism, modernism or even postmodernism. This is literature which is psychologically enriching and emotionally satisfying, whose influence is acknowledged by readers in many countries: and it is written with a very special, playful use of language. 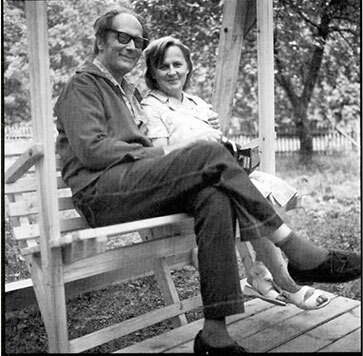 Jaan Kross was married to the poetess, children’s writer and translator Ellen Niit, whom he has also mentioned as his muse. He translated a lot: among others Alexander Blok, Sergei Yesenin, William Shakespeare, Honoré de Balzac, and Lewis Carroll. Kross died in Tallinn in 2007. The second part of his monumental book of memoirs titled “Kallid kaasteelised” (Dear Fellow-Travellers), which Kross finished before his death, appeared in 2008. In 2010 the Jaan Kross Literary Award was established to honour the best publication of prose, poetry, drama, translation or cultural history. He could be compared to Thomas Mann if one is searching for parallels, and has been translated widely. As the Kau Manor area is first mentioned in the Liber Census Daniae in 1241 and the name was written down by Danish monks around 1220, it has been long known that the property was in existence already in Pre-Christian times. However, until 2013 there was no factual proof to this. In the summer of 2013, the first Viking era silver treasure was discovered on the field of the Manor, about 500 metres south of the Manor House. The treasure consisted of more than 30 silver coins, six brooches, five rings, several neck medallions and a silver balance with weights dating to the end of 11th century. Some of the neck medallions, locally made imitations of Arabic coins, are unique. The Kau Treasure samples are the only ones known made using this particular technology. The treasure is of high quality silver and represents Estonian Viking era’s best craftsmanship. It is determined that the treasure must have belonged to a wealthy noble woman living nearby, from the Viking era Masters of Kau. Since 2013 three more silver treasures have been found from the lands of the Manor. The Kau Academy was established in 2011 by Mary Jordan with the goal of supporting established and emerging artists in Estonia. The Academy actively pursues this goal through a variety of initiatives that aim to engage both the local and the international community. The Kau Manor building has been fully restored to its original splendour. 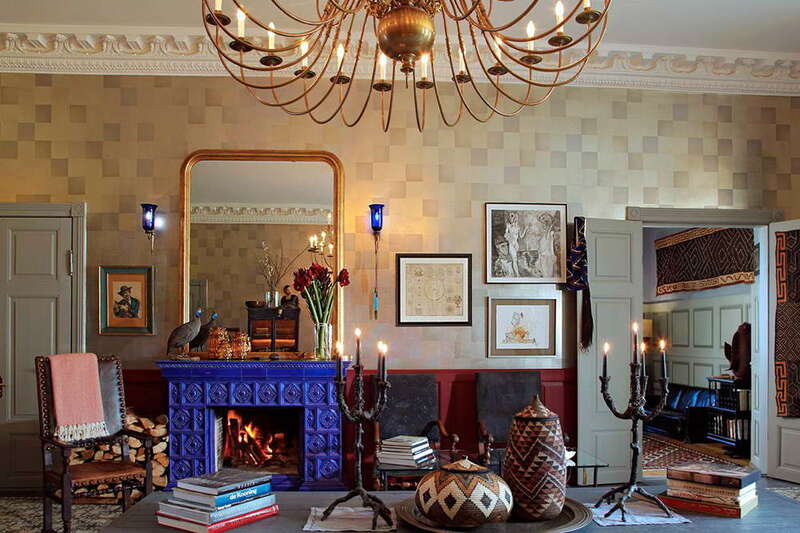 Its magnificent interiors, the inspiration of the acclaimed artist and filmmaker Mary Jordan, are a tribute to the Otto von Kotzebue legacy – twenty absolutely unique rooms with a story to tell. 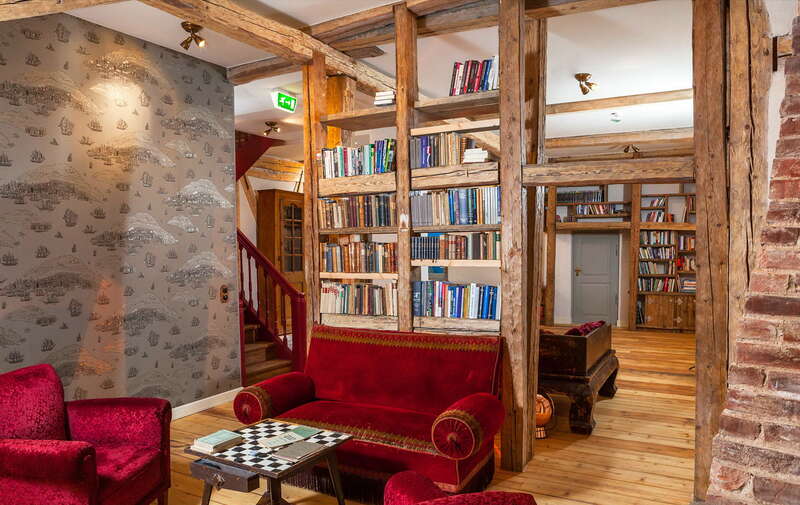 Each is decorated in a singular and irreproducible style, and all rooms feature glorious views of the Manor park or the magical Estonian forest. Reclaimed hardwood floors, centenary beams, high ceilings, stunning antiques, handmade vintage rugs, richly textured custom-designed furnishings, luxuriantly textured wood, leather and felt accents, original artwork, beautiful tiles, French linens, and a bounty of scents and fabrics provide a unique cocktail for the senses. Kau Manor is the first and only Estonian boutique hotel who has received The World Boutique Hotel Award as World’s Most Inspired Design Hotel in 2016.